This New For Us Friday I’m sharing a new and improved version of one of the best things we’ve ever invited into our home: gem jars. 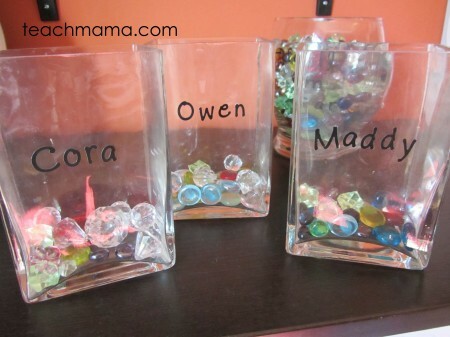 We introduced Maddy, Owen, and Cora to gem jars about two years ago, and it was perfect way to monitor–and manage–behavior for our family for a good long time. 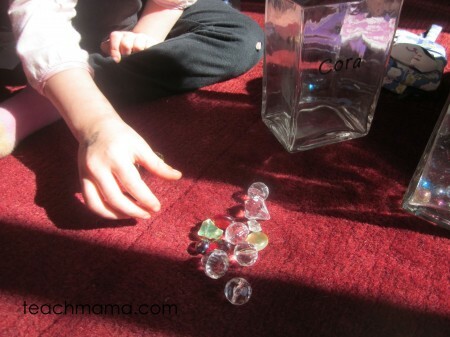 Gem Jars play on positive behavior; instead reacting to our kids’ negative behavior by yelling, screaming, crying, or punishing–gem jars require a major shift in focus. Instead, we rewarded positive behavior. And it was great for our then 6, 4, and 3 year olds. being extra helpful to others. . . you name it. The idea is that the rewarding, noticing, validating of positive behavior will make that behavior the natural choice. And in time, it will become one big, happy habit. A perpetual Nicefest. But as the kids got older and we knew we were ready to welcome a weekly allowance into the mix, my husband and I brainstormed, chatted, and thought our way through adopting a system we knew worked–gem jars–but using it in a new and improved way. 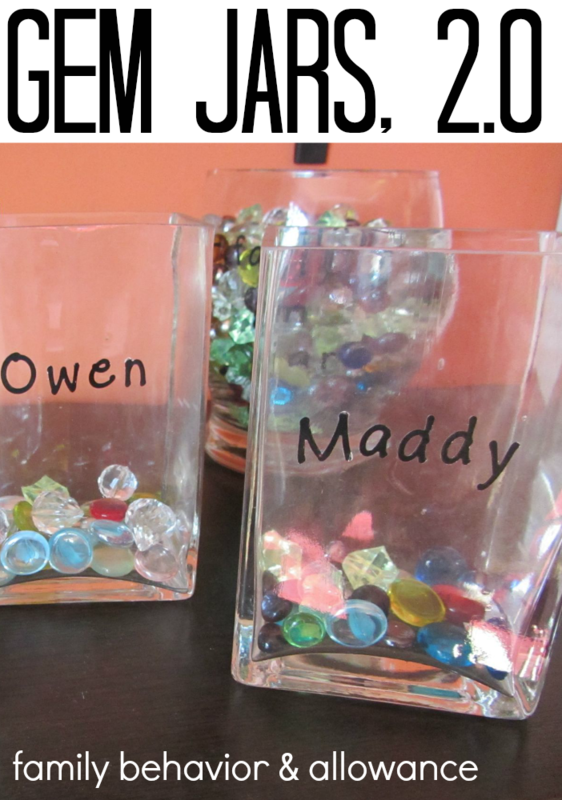 Gem Jars 2.0: Maddy, Owen, and Cora have been asking for an allowance for months and months now, but my husband and I just couldn’t seem to find a system that worked for us. We wanted something easy. Seriously. Easy. This parenting gig is hard enough with homework, down time, cleaning, family time, discipline, friends, school, sports, spouse time, work time, and extra-curricular activities that we knew one more thing could literally send us both over the edge. And we knew that for a good year and a half the Gem Jars worked wonders for us. Admittedly, we slowed down on them at the end of last summer because I was working, my husband was working, and we were just. . . plain. . . tired. And in order for things like the Gem Jars to work–like any discipline system–consistency is key. Consistent we were for a good long time, but we were ready for something new. 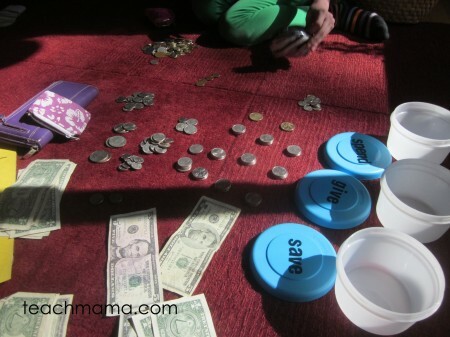 So we pulled out the old Spend, Save, and Give Jars–a method that we have used for organizing the kids’ money–and we decided to move forward with Gem Jars, 2.0. I said, Okay, you guys have been waiting for an allowance for months and months and months now, and Dad and I have been trying to figure out the best way of doing allowance for everyone. Finally we think we have a way. We’re going to use Gem Jars. But we’re going to use them in a slightly different way than we have been using them. We were sitting on the floor in our craft room, with the Gem Jars emptied and the kids’ Spend, Save, and Give jars all around us. Here’s what we’re going to do: we’re going to start each week with 20 gems in everyone’s jar. And from here on out, each gem is worth ten cents. So if each gem is worth ten cents and you’ll have twenty gems in your jar, how much money will you have at the beginning of each week? 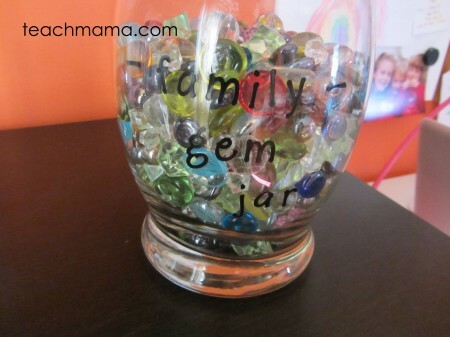 First, we re-organized the Spend, Save, and Give jars. . .
. . . and then we counted the week’s worth of gems. I said, Okay, so everyone find twenty gems from the family gem jar. They lined up twenty gems. And count by 10’s. Before I finished giving them instructions, Maddy and Owen called out, We’ll have two dollars! We’ll start with two dollars! My husband went on to explain: Yes, so you’ll automatically earn two dollars each week for doing your jobs around the house–making your bed, keeping your room clean, setting the table, and picking up just like you’re expected to do. Owen counts his end-of-the-week gems. 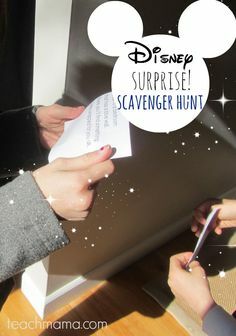 Then throughout the week, you’ll have the chance to earn extra gems–by helping Mommy or me, by being especially kind to each other, to doing some extra things we ask you or that we notice you do. And each Sunday night we’ll get back together and we’ll count your gems. And that’s it. 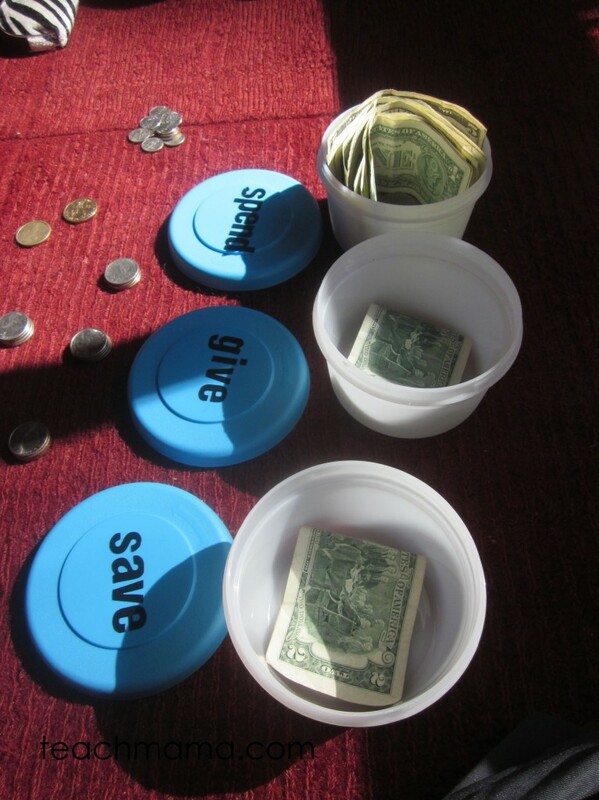 I went on: We’ll divide whatever money you earn for the week into three parts–half you can put in your spend jar, and the other half we’ll divide evenly into your save and give jars. But here’s the catch: just like our gem jars, you can earn extra gems by doing great things and making good choices, but you can also lose gems by not making good choices. And this time, if you lose gems, you lose your allowance. Make sense? It did, and they were game. 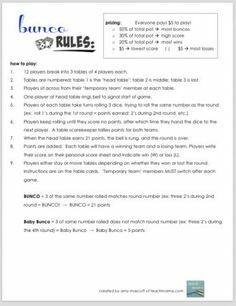 We decided that just for kicks we’d keep track of how much each person earned–not to make anyone feel bad but just to keep track in case any questions arose down the road. So that’s what we did. We gave each child cold, hard cash for the amount of gems in each person’s jar. We organized the money they already had in their jars–which had kind of become a mess after being inconsistent with it for a bit of time. We counted the money they had, and we divided it roughly the way we explained above: 50% in spend; 25% in save; 25% in give. Maybe it’s not the best breakdown, but it’s what we decided on for now. And though we know it is a work in progress–as is much of parenting and teaching–we do hope to stay consistent with this game plan for as long as it works. And when it stops working, we’ll reevaluate and go from there. A happy, happy New For Us Friday it was today because we actually took the time to re-vamp something we love and organize something we’ve wanted to for quite some time. I feel good about it, my husband feels good about it, and the kids feel great about it. I love the idea that we begin the week by assuming the best, most positive outcome: that Maddy, Owen, and Cora will make the right choices and will keep the $2.00 they earn by being cool kids and by doing their expected jobs around the house. I love that it monitors behavior by giving us the flexibility to reward good–or poor–choices. 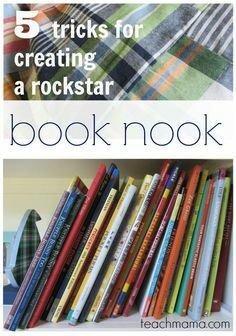 I love that it works for all three kids, and the kids see a tangible reward for their work. I love that we’re finally revisiting the idea of helping the kids to learn about money and money-saving. And I love that this system requires no paper, no charting, nothing major. It’s easy. We just need to have cash on hand each Sunday, which isn’t that hard but will definitely be something I need to remember in order to help this whole process work well. I know that. And for the last few weeks, it’s worked for us. Three cheers for Gem Jars 2.0 and here’s to hoping we have a long and lasting relationship! Any ideas? Suggestions? Lessons learned or things to share? Please do tell–we need all the help we can get, and I know there are experts out there!! Thank you, thank you, thank you so much for your kind words, my friend! Like I said, it’s a work in progress–but we’re ready to adapt as necessary! Many thanks for reading and taking the time to give me this kind feedback! thanks so much, Diane!! 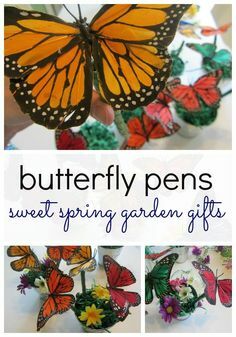 Gems were bought at a craft store–there are about a MILLION awesome, beautiful ‘gems’ to be found! I just saw the article arround and came to your site, Im just 23 but allways wanting to learn this kind of knowlege for when I have my owns… this is a great idea, and a nice way to help little kids to understand money value. I just have a question; if they are given 2$ at week start for doing what they are expected for, what if they don’t do it, I mean if they don’t help arround what would you do? if they don’t do what is expected of them–make bed, pick up clothes, etc, we take away a gem. It’s not a perfected system, but on week #3, it’s still working for us! My kids do earn a small allowance for financial decision making- church offering, to choose a treat at the store, etc This chart has things on it like put away dishes, help watch baby brother, put away laundry, etc. We stress that the allowance isn’t extreme, because they “should” help the family because they are part of a team. I hope your system works for you. My biggest challenge is staying consistent and remembering to put gems in or to post chores. I too have had issues with figuring out allowance with my three kids all under 10. I have a question about the dividing the money into thirds. 50% to spend… How and on what? 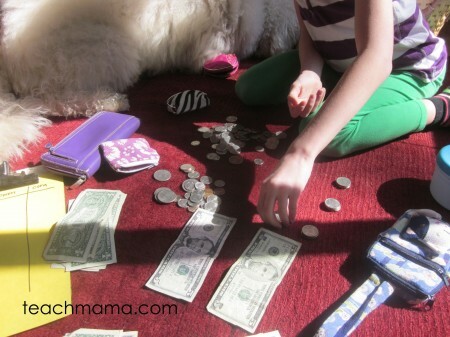 My kids want to blow their money each week and on a lot of times just something plastic. What about the 25% to give? Who do you give it to? $24/year each seems extremely generous for my three kiddos. Plus I’m having a hard time selling that to my husband on giving all of the money away. Any ideas with that would be helpful. Also, my last question was about the saving. Do you go to the bank or have accounts set up for them to deposit or does it just go to a piggy bank? Then if it is a piggy bank, then where does it go when full? It still works and my oldest is now 11. We’ve been doing the gem jars your version 1 for years now. We don’t add to them for allowance but it does count as money. 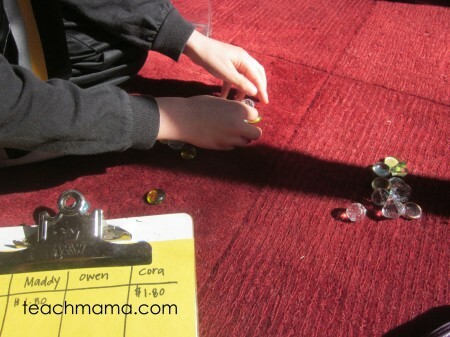 They use their marbles to purchase items from the “Mommy store.” Which are all the things I can find on sale, at thrift store etc that I know they’d want and I’d want them to have. By making them “purchase” it I’m not always giving them things for no reason. 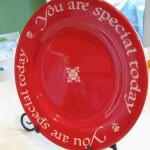 Items are on the level of stocking stuffers or Easter basket goodies. For instance this week Target has Paul Frank duct tape $2 off. I picked it up since it’s rarely on sale. My 11 yr old is planning her weekend around extra chores to buy it from the store. ANGELA. SUCH a great idea. I love it. Do they get to make purchases every week? How / when do you handle the ‘sale’? This is so timely as just last week we started the SAME THING in our home with my two older kids. They want an allowance and I wanted a way to reward positive things and try to give them incentive to not do little annoyances (like leave clothes on the floor). So far, so good! I hope we can stick with it. We’ve been using the gem jars concept for over a year now and they continue to work so well. 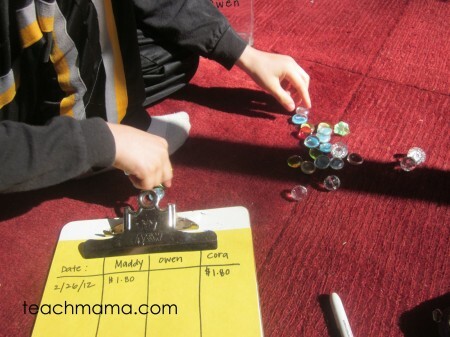 Our kids use gems to trade in for electronic time or for cash. One tweak I’ve made as the girls have gotten older (almost 7 and 9 now) and the 9 year old LOVES trading hers in for money and buying stuff is that the “trade in for cash option” is only available once a week – and I have to remember to have quarters and dollar bills on hand! 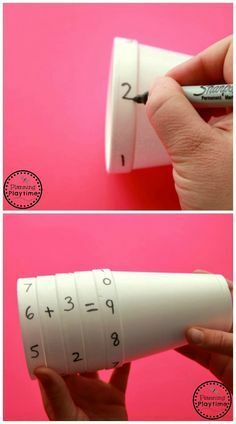 LOVE THiS IDEA!!! Thank you so so so much for sharing, my sweet friend! Please continue to keep me in the loop! My kids are too small for allowance but I do have some discipline issues. Here’s the question I always wanted to ask – if you’re *rewarding* your children with money – say they tidy up their room and get reward for that, don’t you feel like they do that because they want the reward and not because they feel they need to/it’s messy/mummy asks them to do that? Great question! I suppose you have to do what is best for your family, and in our attempt to teach kids how to best handle money, they needed to earn some! BEcause they’re still young–10, 8, and 7–they really can’t earn money outside of the home for some years. 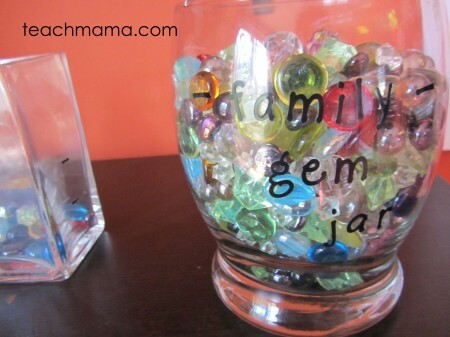 So yes, our gem jars do reward kids for doing chores that should be considered ‘expected’ in the home, but we, too, are learning–so we thought that because the monetary amount was so low, we could afford to use this opportunity as a learning experience in several ways. Works on the same principle as above, but once they have earned sufficient gems, they can buy items from “MUM’s SHOP” items which have been pre-purchased, that parents know they will need, want, like. 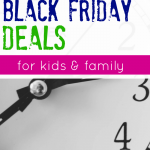 That way they don’t get overwhelmed when the go to the store and begin to fill the trolley, resulting is a possible meltdown and undoing all the previous good work..
Voucher for Nanna to do ; Hi Tea with fine china & a variety of very small treats. 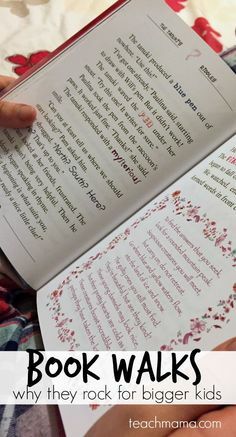 Request ticket; something the child can request that the shop can stock. 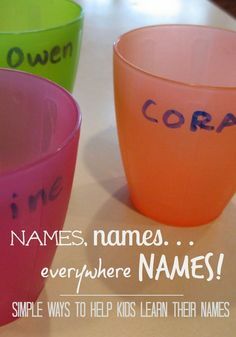 I also use it in my childcare service to correct inppropriate behaviours, its a compliment to role-modeling, and it instills self-regulatory skills. JO! You totally win the award for the MOST helpful comment EVER. 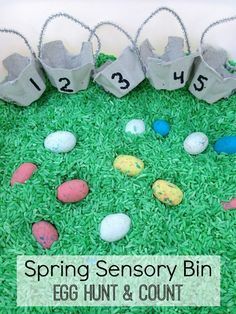 I love how you have adapted this into your own ‘shop’ and love, love, love that you took the time to share. I will definitely take pieces here to use for our own kids–and hopefully others will, too! WOOT!